With the introduction of Elastic Load Balancing (ELB) access logs, administrators have a tremendous amount of data describing all traffic through their ELB. While Amazon Elastic MapReduce (Amazon EMR) and some partner tools are excellent solutions for ongoing, extensive analysis of this traffic, they can require advanced data and analytics skills. Often the need to analyze your ELB logs is in response to an incident, so the ability to analyze many terabytes of logs quickly with skills already available to the team is critical. Fortunately, it’s a relatively straightforward process to set up an Amazon Redshift cluster and load your ELB access logs for analysis via SQL queries. This post explains how to do this whether your goal is ad hoc, time-sensitive analysis in response to an incident or periodic, straightforward log analysis. With Amazon Redshift’s ability to quickly provision a data warehouse cluster from terabytes to petabytes in size; ingest massive amounts of data in parallel; and expose that data via an ODBC/JDBC PostgreSQL interface; it is an excellent solution for SQL-based analysis of your ELB logs. If you have experience with Amazon EMR and would perform MapReduce-style analysis on your log data, AWS has also created a tutorial to help you load ELB log data into Amazon EMR. Whichever method you choose, calculate the size of the data you will load. Next, you’ll set up an Amazon Redshift cluster to hold your Elastic Load Balancer access log data. To begin, log in to the AWS Console and select Redshift from the Services menu. As part of launching your cluster, you must create a security group that allows you to import and access your data from your SQL client while blocking any other traffic. The security group can open access to your Amazon Redshift cluster from a specific CIDR block or an Amazon Elastic Cloud Compute (Amazon EC2) security group. While you will install the SQL client in a subsequent step, identify the host now so you can create the proper security group rules. If you plan to run the SQL client on an Amazon EC2 instance, know the security group protecting that instance. If you will run from an on-premises workstation, you need the IP address (or address range) that represents that workstation on the Internet. After identifying your SQL client host, click Security in the left menu of the Amazon Redshift screen. On the Security Groups tab, click the blue Create Cluster Security Group button. Note: Cluster Security Groups are only necessary in EC2 Classic accounts when you are running outside of a VPC. 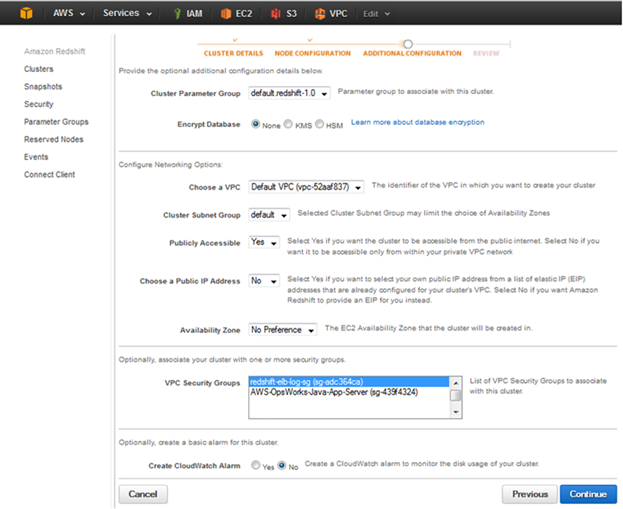 For VPC by Default accounts you will want to create a VPC Security Group with the same Inbound Rules through port 5439. Cluster Security Group Name Any name you like that refers to this group. Description Description for this group. After completing the fields, click Create. The group is initially created blocking all traffic. You must create a rule to allow the traffic necessary for you to use your cluster. Select the box next to your new group and then select CIDR/IP in the Connection Type dropdown box in the details window. If you’ll run your SQL Client on this machine, fill in the box with a CIDR/IP range containing your IP address (which is shown on the screen). If your SQL Client will be on a different machine, enter a CIDR block that includes that machine’s IP address. After filling out the fields, click Authorize. Note: The previous instructions identify your SQL Client by IP address (either on-premises or an Amazon EC2 instance with a public IP address). If you are using an Amazon EC2 instance, you could alternatively identify it using a security group assigned to the instance by choosing EC2 Security Group in the Connection Type dropdown box. Your security group is now created and it is time to create your cluster. Click the Clusters link in the left column menu. On the next page, click the blue Launch Cluster button. Cluster Identifier Any lowercase name you want to apply to your cluster. Database Name Name for your database within your cluster. You don’t need to fill in this field. If you leave it blank the default name dev is used. Database Port Port for connecting to the database. You can leave this on the default value unless your corporate network firewall blocks port 5439, in which case you should choose a port not blocked by your network firewall. Master User Name This account will be created for you to access the database. Master User Password / Confirm Password Password for the Master User Name account. Note the policy requirements. After completing the required fields, click Continue. Node Type Determines the CPU and storage space of each node. The cheapest possible cluster is a single dc1.large node, which is currently 25 cents/hour in US-East-1 and provides 160 GB of SSD storage. If you are new to Amazon Redshift, you may be eligible for a free trial that offers 750 hours per month of dc1.large usage for free for two months. Look at the storage of the different node types until you find a combination of Node Type and number of nodes that gives you enough space. Small node types may not store as much data, but they allow you to scale up in smaller increments. Cluster Type Decide between a cluster consisting of one compute node (single node cluster) or multiple compute nodes (multi-node cluster). For very small data sets a single node will work fine, but once you get to several TB you should go with a multi-node cluster. Number of Compute Nodes Choose how many compute nodes you want to deploy in your Amazon Redshift cluster. 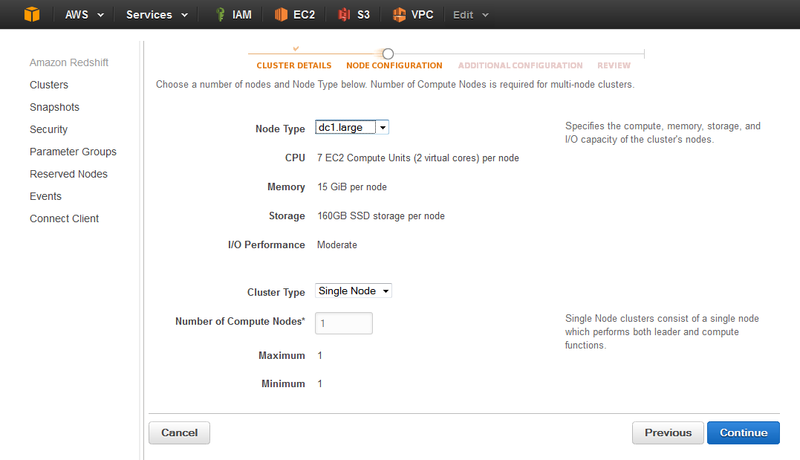 Because Amazon Redshift uses the instance storage on the compute nodes for storage, the total storage of your cluster is the (total storage for your Node Type) x (the number of Nodes in the cluster). After completing the fields, click Continue. Cluster Parameter Group Use the default value here. Encrypt Database By choosing KMS or HSM in this box you instruct AWS to encrypt the data on your Amazon Redshift cluster with the Key Management System or CloudHSM. You probably don’t need to choose this for your access logs and can choose None. If you have an older account that is EC2 Classic (without a default VPC) you will not see that option and you do not need to run in a VPC. You can choose Not in VPC here. Cluster Subnet Group (VPC Only) Use the default value. Publicly Accessible (VPC Only) This determines whether the cluster can be accessed over the Internet as opposed to through a VPN or through a bastion host. Choose Yes for this example. Choose a Public IP Address (VPC Only) This determines whether the publicly facing IP address will be an EIP that you assign (Yes) or automatically assigned by AWS when the instance is launched (No). Choose No for this exercise. Availability Zone Leave this at No Preference for this use case. Choose the Security Group you created at the beginning of this section. Create Cloudwatch Alarm In this section, you set up an alarm that notifies you if your Amazon Redshift cluster is in danger of running out of space. Since this use case is to create a cluster for a very short use case, choose No and ignore the rest of the fields in this section. On the Review page, check your settings. You can also see the hourly cost for your cluster before it launches. If everything on this page looks correct and you are OK with the cost, click Launch Cluster. Your cluster will take several minutes to launch. While it launches, go to the next section to set up your PostgreSQL client. SQL Workbench/J: A free PostgreSQL client. AWS provides instructions for installing the PostgreSQL client (scroll down to Install SQL Client and Drivers). Be sure to follow the link to Configure a JDBC Connection to download the Redshift JDBC driver. 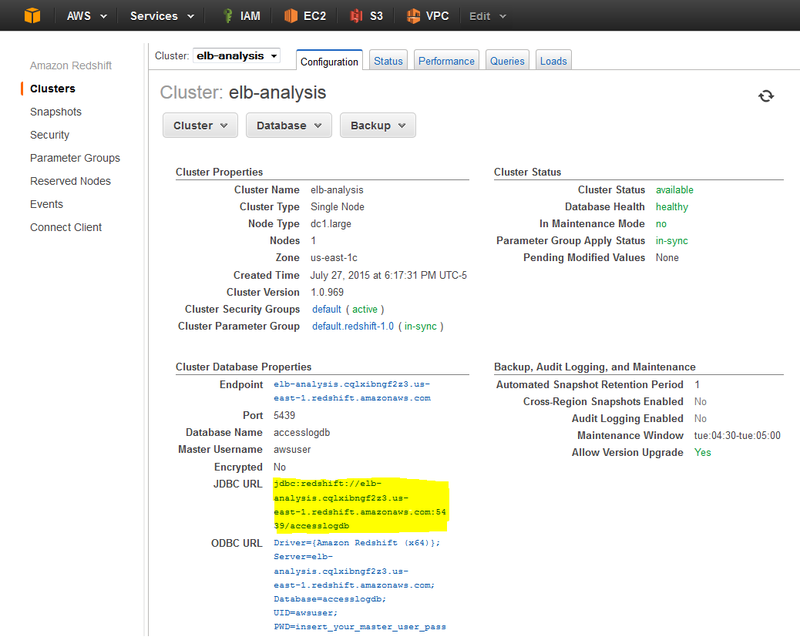 To see all the details for your cluster, click the Info icon next to the cluster name to display the screen below. Key values on this screen are the JDBC and ODBC URLs for accessing your database (JDBC highlighted above). 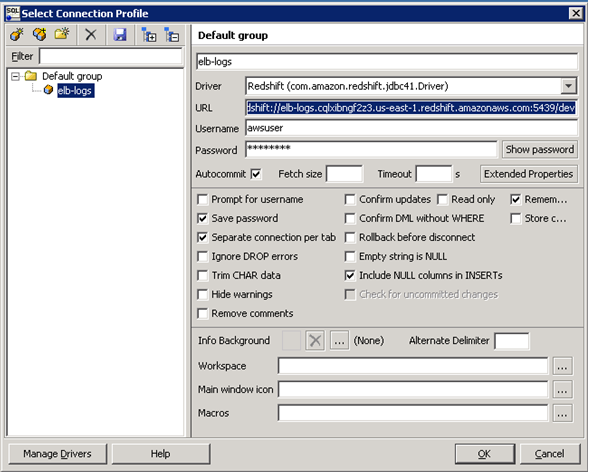 Open your Amazon Redshift client and navigate to a screen that allows you to create a new connection. This example demonstrates SQL Workbench/J, but should be easy to translate to your favorite SQL client. In the diagram below, note the information from the Cluster Details screen. The URL field contains the JDBC URL from the Cluster Info screen above. 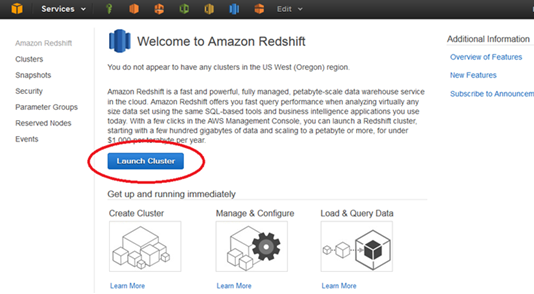 Use these details to open a session with your Amazon Redshift cluster. Note : The encode terms above define the specific compression used for each data column. When designing your own tables in the future, Amazon Redshift’s COPY command can, on first load, automatically choose appropriate compression algorithms for each column based on sampling your input. An explanation of the contents of each of these fields can be found in the documentation. You don’t need to run the VACUUM command after the initial load, but it is a good habit. Your data is now loaded into your Amazon Redshift data warehouse and is ready for analysis. You can now use any PostgreSQL query to examine the data in your table. To help you get started, here are a few common examples. With a few quick steps, you set up and populated a data warehouse containing a huge log of access requests and ran queries against that warehouse to gain insight into your ELB traffic. After analyzing your data, remember to delete your cluster so you’re not charged for it. As you have seen, it’s easy to recreate the cluster if you’d like to revisit your analysis. If you have questions or suggestions, please add a comment below. Update 12/3/14: This post was updated to accommodate log entries for non-HTTP calls which have a slightly different format. The NonHttpField column was added to the Amazon Redshift table and the FILLRECORD option was added to the COPY table. Update 8/3/2015: Changed the table format and the copy command to keep quoted log entries as a single data value rather than parsing them. This allows us to successfully do all ELB formats from 2014 and 2015. 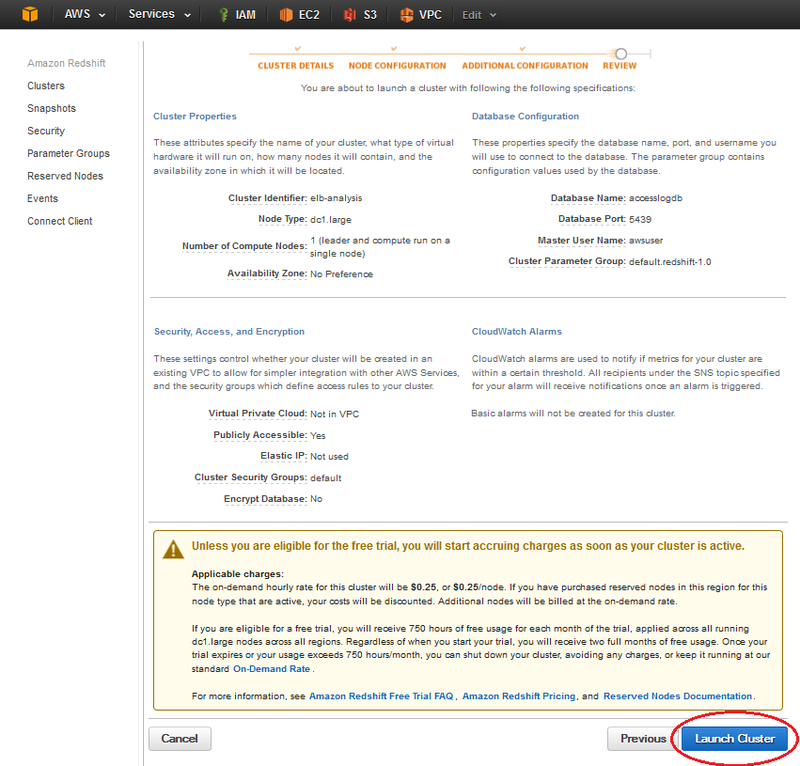 Also highlighted prompts and options that will be different in VPC by Default accounts.